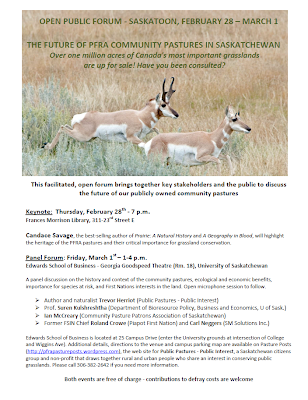 The Permaculture Research Institute of Saskatchewan is holding a potluck supper on February 21. After supper, Jessie Best and Shaun Abs, who have recently participated in a Holistic Management workshop, will make a presentation and lead a discussion on holistic management. Saskatchewan and other prairie provinces are starting to adopt this method of farming as a way to build topsoil, store carbon, improve animal care, and rejuvenate water cycles. 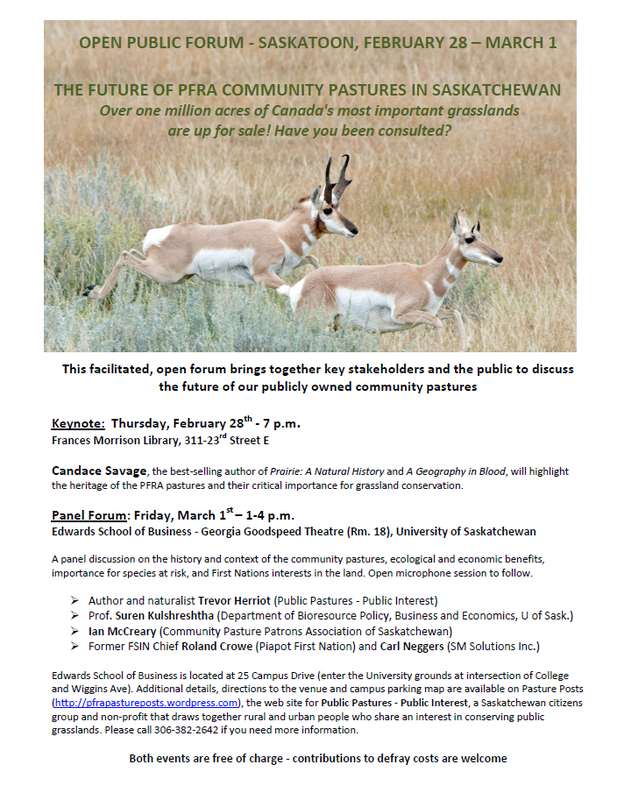 Over one million acres of Canada’s most valuable grasslands are for sale, and Public Pastures – Public Interest is hosting two forums in Saskatoon to share information. At 7 pm, February 28, at the Frances Morrison Library, Candace Savage will highlight the pastures’ heritage and their importance for grassland conservation. A panel of speakers will address various topics related to the pastures on March 1 from 1-4 pm in the Georgia Goodspeed Theatre, Edwards School of Business. Scott Vaughan, Commissioner for Environment and Sustainable Development, will present highlights from his most recent report to Parliament in a one-hour webinar on February 25. The Saskatchewan Eco Network is collaborating with the federal government in offering an informal presentation on A Guide to the Environmental Petitions Process. It will be held on March 4 in Regina and March 6 in Saskatoon. Contact SEN if you are interested in attending as they need to know numbers before booking a facility (info@econet.sk.ca, 652-1275). Enjoy an indoor presentation by Rebecca and Glen Grambo on their most recent book, Wolf: Legend, Enemy, Icon, at Elk Ridge Resort on March 9, along with live music courtesy of Sundogs Excursions. After the indoor program, drive into Prince Albert National Park and try to howl for the wild wolves. 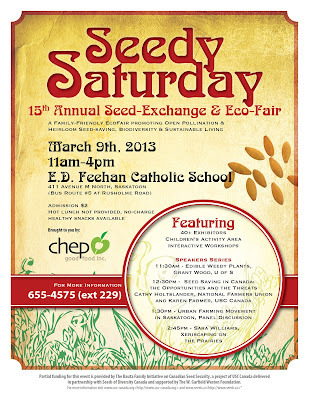 Don’t miss CHEP’s 15th annual seed exchange and eco fair on Saturday, March 9, from 11 am to 4 pm at E.D. Feehan Collegiate. 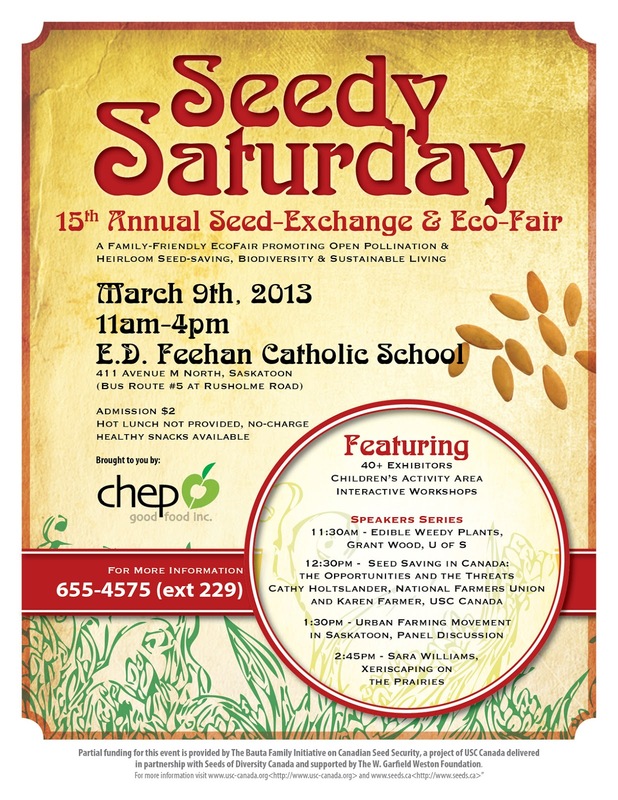 There will be over 40 exhibitors as well as speakers on edible weedy plants, seed saving, urban farming in Saskatoon, and xeriscaping on the Prairies. Wild About Saskatoon and Slow Food Saskatoon both plan to be there. Grade 10-12 high school students and teachers from across the province are invited to attend a day-long Green Transportation Workshop in Regina hosted by the Saskatchewan Eco Network. To register, contact Rick Morrell at info@econet.sk.ca or by phone at (306) 543-2784. The Wildlife Rehabilitation Society of Saskatchewan is hosting the IWRC training in basic wildlife rehabilitation on March 30 and 31 in Saskatoon. Wild Birds Unlimited has just opened. The store is next door to Saboroso on 8th Street and sells everything from wild bird seed grown in Alberta to bird houses, bird baths, and decorative items. The owners are very supportive of local environmental groups.